At the risk of being accused as having no imagination-whatsoever, I've decided to do another round of inspiration outfit copies. So, I got 2 new pairs of khakis recently. I haven't owned khakis in YEARS. I forgot how much I liked them. Here are two outfits that I put together recently. I have a cardigan in every color of the rainbow...except for orange. Note: I don't really wear orange...idk. So, I opted for hot pink and rolled with it. I liked this look ESPECIALLY after I added a belt. I like the look of shirts with collars and cardigans. (Random, while typing this, I completely brainfarted and forgot how to spell collared. Collard. Collered. Seriously.) I don't think I'll actually wear this look out. The double layers over the arms were kind of weird and bulky. Eh. Believe it or not, this is a DIFFERENT shirt from the blue and white striped tee in last week's outfit. ;) I have 2 blue and white striped 3/4 sleeve shirts. Weird. I heeded last week's advice and tried a colored belt even though the inspiration outfit didn't have a colored belt. I feel like I can rock red, white and blue without looking like Aunt Sam...female version of Uncle. HA! Pssst...I might actually wear this last outfit. Most of these I don't actually have the courage to rock outside of the house...either because it's a little inappropriate for either job or because it wouldn't be comfortable. But this one...definitely worth a try. 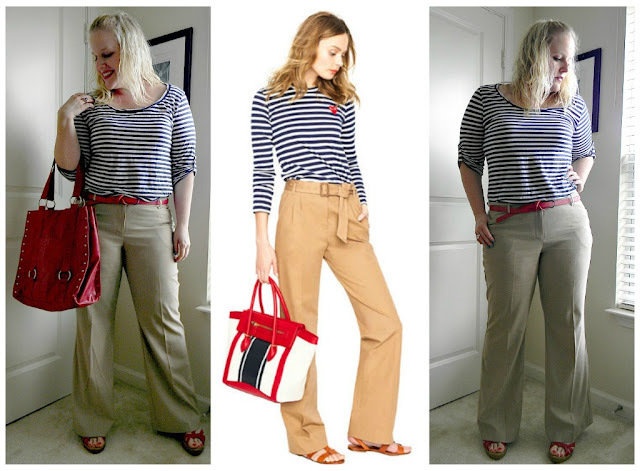 Linking up with Lindsey at The Pleated Poppy for What I Wore Wednesday. Love the second one! I like the button tab detail on the sleeve and the red accessories. That second one makes you look very slim. I guess your NYR is working! the second outfit is super cute!! LOVVVVVVVVVVVVVVVVVVING the second outfit. SO CUTE. the red belt with the blue and white stripes is perfection. you took sailor chic to a whole new level! love the first one belted, and i'm always a fan of stripes! 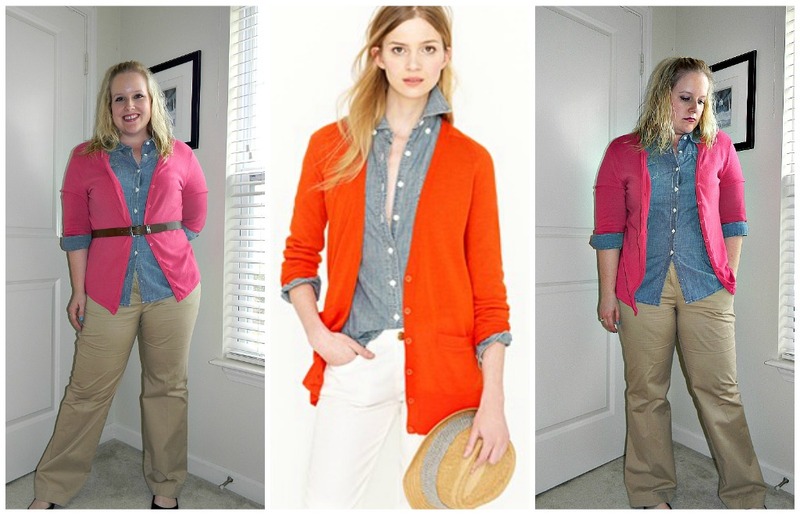 I am LOVING your outfits and your blog! Found you on Mingle Monday! Yay for Mingle Monday friends! Thanks!